Here are some fellows for Plush You 3 at Schmancy in Seattle. The show opens October 12 and will be held at three stores this year (Schmancy, Fancy + Pants and Nancy). Three whole stores featuring toy art goodness. 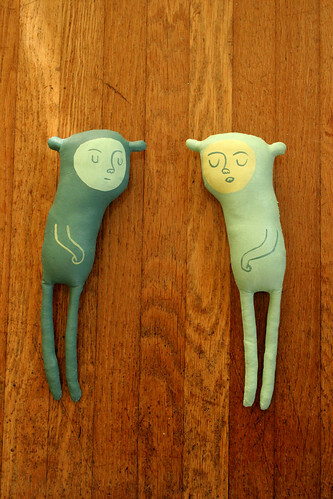 These guys are made from painted & stuffed muslin. I named them Nan and Gom, short for Nanthild and Gomatrud, two of the wives of Dagobert I, a 6th century king of the Franks. Obviously. I love love love these pieces. I would love to work with you going forward in The Shiny Squirrel. ANy thoughts on a limited edition Softie?? They look really cute - I love the extra-long legs. i love their ears + legs. awesome! They truly are fabulous + really, you did not need to explain the names, I think it was quite obvious. Well, not really, I just got a good chuckle out of your last sentence. It looks as if the one on the right is saying something. but what? if i was a softie, i would want to be the one on the right! sweet!